News hit Nashville this week that beloved local independent bookstore Davis-Kidd is closing in December. Davis-Kidd is something of an institution around here, and while not truly "independent" in the rawest sense of the word--it is owned by the Joseph-Beth Group--the forthcoming shut-down has many Nashvillians already feeling pangs of loss. Excessive use of hyphens aside, I am trying to be sympathetic to those who have expressed concern over the "death of the independent book store." Admittedly, however, I'm having trouble with that. Look, I get it. People form attachments to retail locations. Record stores, coffee shops, and hardware stores are all popular community favorites. For authors and avid readers, there's something even more magical about a bookstore. It gives me a warm and fuzzy feeling walking into a book shop and catching the aroma of billions of pages, that slight hint of ink, blended with the fragrance of ideas swirling in the air. But at the end of the day, it's a retail store. It is bricks, and mortar, and shelves and employees. It is commerce. And in that respect, it is neither unique nor magical. Independent bookstore employees are better qualified & know more about books - It's true that "big box" stores will employ just about anybody with a pulse. But it's ignorant to assume every employee at an indie store is inherently knowledgeable and every employee at a corporate store is clueless. My local B&N has been around for at least 15 years, and the employees are educated and passionate about their various departments. The indie bookstore is an American icon - I roll my eyes to this one. Considering that moveable type is still a relatively "new" invention in the stream of human history, and that literacy amongst "ye common folk" runs almost parallel to its existence, book stores are not ancient and hallowed ground. Libraries are. As I mentioned earlier, I understand forming an emotional attachment to a retail location, but the fact remains that many of America's most beloved independent bookstores were opened in the 20th century. There are older car dealerships out there. 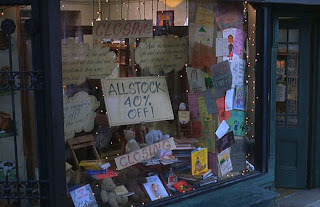 If [insert indie store here] closes, where will people get books/authors promote? - Again, another eye roll. It's not as if books turn into a scarce relic the moment an indie bookstore closes. There's likely another option available to the community, whether it be a library or corporate bookstore. There's also online sites aplenty. Corporate bookstores still host author events and signings. They have story time in the KidLit area. You can sit and read there for hours undisturbed, without actually buying anything. To be clear, I'm not saying I don't support local businesses--especially bookstores--because I do. However, I make my decision on where to shop based upon distance, price, service, and availability. For example, there's a Books-a-Million less than 3 miles from my home, but I happily travel 14 miles to B&N because the Books-a-Million has mediocre service, high prices and lackluster selection (not to mention a depressing Children's section). The Davis-Kidd that's closing next month is twice the distance as B&N--not exactly "the shop around the corner." Alternatively, if I need a book and I'm not in a hurry, I usually turn to Amazon.com or BN.com. The bottom line here is that, as a writer and book-lover, I am genuinely trying to understand more about why people are so grieved by the closing of a local independent bookstore. What are your thoughts? Do you bemoan the closing of indie bookstores? Do you not care? Do you prefer B&N or Borders, and why? Sound off in the Comments section and give me the benefit of your perspective. Give me a compelling reason not to feel so indifferent, and I promise to listen with an open mind. To me the idea of losing an independent bookstore is like losing another "little guy" to the big corporate engine of greed. Most US citizens lament the loss of their local stores, calling the big conglomerates "bad" while shopping at Walmart for their groceries and other needs. The loss of another indie store feels like another loss to big corporate greed, and that is probably the biggest reason people lament the loss of the truly "local" bookstore. I think if indie book stores don't survive, they can at least be reborn. How that will play out in a digital world remains to be seen. Maybe more like hybrid coffee/reading lounges where people go to have their most beloved eBook printed and bound? I don't like the big chains, especially BAM. Even smaller chains are better, but those are vanishing as well. Think most will go the way of the record store. Yeah, remember those? @Howling - I get the idea of rooting for the "little guy." We all have a tendency to want to see the underdog win. But I don't buy the "corporate greed" angle. As a local business owner myself, I can emphatically state that ALL businesses exist to make profit. "Cottage industry" businesses (I like that phrase, btw) may approach things from a perspective of being passionate about what they do, but passion doesn't keep your books in the black. Maybe, instead of "greed" it's perhaps the emotional stand-off-ish-ness (not a word, but a Martinism) people dislike, which makes sense given the fact that both rooting for the underdog AND appreciating people who are passionate about their work are both emotional responses. @M.J.A. Ware - Love the idea. Starbucks will be offering e-book rentals soon (or so I hear). Maybe that's the future? Which reminds me: Starbucks is a huge int'l chain, but when it proliferated I didn't hear anyone lament the loss of the local cafe. Matter of fact, when I go in to my local Starbucks, they all know me (and my drink of choice) by name, even my wife and kids. They're probably an ideal example of a "big corporate chain" done right, no? @Alex - I do remember, and Nashville still has some GREAT ones. I think it comes down, honestly, to price, service, and selection for 95% of the populace. Big chains are capable of offering all 3. But what is it about them you don't like? I think if Indie book stores want to survive, they need to change their business model around a little bit. Same with many retailers in the changing way we do business, incorporating the internet and everything. I'm personally not attached to indie stores and like you I don't really understand what the big deal is. For years now, I have had to catch "the aroma of billions of pages, that slight hint of ink, blended with the fragrance of ideas swirling in the air" (love that phrase) at my local library. I have no more room for books and when I count those on my shelves that I have not read, it's embarrassing. So I try to borrow books instead. (Why, when I have so many of them at home I haven't read? Go back to that lovely phrase!) I have a few favorite local authors that I support by buying their books, but outside of that I've stopped allowing myself go to bookstores. Much. I think the more independents that go down, and the less companies that own market share, is bad for customer service. All of the angst and perceptions of badness that people associate with chain retail only get worse when those companies no longer have the need to compete because service tends to decline. To me the main difference for me is that in an independent the employees tend to make me want to read books, and in a chain bookstore the employees tend to make me want to strike them with books. Optimism on Sale - Selling Hope out today!